CR03 is a 4,500 sqft, 5-bedroom/4.5-bathroom residence situated on a 2.5-acre private beachfront estate at Mal Pais, Costa Rica. 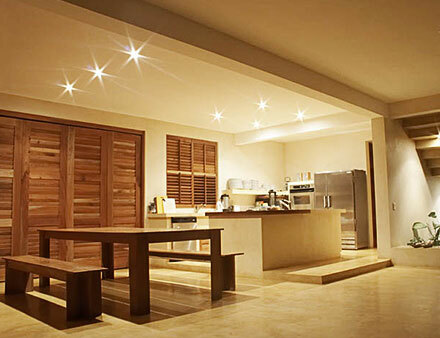 CR03 is a luxury beach home retreat on the serene Pacific side of Costa Rica's Nicoya Peninsula. Built for escape in real soothing tropical comfort for sophisticated travellers, and completely private accommodation, CR03 provides the most intimate stay anywhere nearby. No clutter, no annoying interruptions, no noise but nature's own; easy, pure, and blissful. This luxury rental beach house boasts five distinct, separate bedrooms with built-in fixtures, ceiling fans, large closets, and intimate baths. Hand-carved, louvered doors open each room wide to the tropical flora, warm sun, and undulating surf, blurring the line between inside and out. Read a book on the daybed outside your room, soak in a bath while watching the sunset, or enjoy dinner with friends. The beach house has large open-plan living/seating /dining/kitchen areas all flowing seamlessly onto patio looking directly toward beach, just 75 meters away. The five bedrooms have en-suite bathrooms, two having large custom baths with views, ceiling fans in each room, and built-in natural cooling airflow, with a fountain and water trough running along east side. 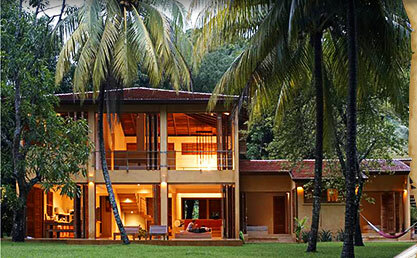 Fertile mango, coconut, banana and orange trees abound along with abundant native fragrant flowers. Master bedroom upstairs: super king size bed, en-suite double shower, large double custom made concrete bathtub with beach views, double custom made sinks, lavatory and built in cupboards. Guest bedroom 2: super king size bed, en-suite custom made concrete bathtub with sunset views, shower, double sinks, lavatory and built in cupboards. Private patio and daybed. Bedrooms 3 & 4: king size bed, shared large bathroom with double shower, double sink, lavatory and two walk-in cupboards. Private patio and daybed. Kitchen: fully equipped, including large American stainless steel fridge/freezer, eye-level oven and microwave, ceramic hob, dishwasher, juicer, blender, coffee maker, food processor. Full cutlery and crockery for 12 people. Stereo/CD player with connection for iPod. Beach: semi-private cove just 75 meters from patio, with soft white sand, easy walk to ideal swimming, surfing, and fishing spots You never get bored in Mal Pais.There is always plenty to do once you tire of lounging lazily, and something for everyone within an easy distance. Surfing and Swimming Our very secluded beach lies right on our doorstep - just 75 meters away - for the adventurous surfer, eager swimmer, relaxed sunbather or keen angler. And if it is snorkelling you are after, the perfect spot is "The Swedish Beach", tucked away behind Sunset Reef Hotel, a brisk 15-minute beach walk. CR03 is available for vacation rentals at $1,500/night and is for sale at $4,000,000.